Hi all!! Today I was feeling a tad colorful, so I thought I'd take my friend Erik's (of Vegas Made Me Do It fame) suggestion, and do crayons!! We never ever get too old for crayons, hell, I'm 28, and have the 64-pk with built-in sharpener in my desk drawer. (You HAVE to have the sharpener) Plus, one of the best time killer websites that I like to haunt is the Crayola site. :-) you can even test out their 'glitter' crayons on the online coloring pages!! :-P I'm SUCH a dork. I know. I discovered the fun side of their site back when I lived in Michigan, I used to work for a children's educational software publisher. I used Zoya Pippa as a base, with Zoya Midori mixed with Nubar Forest for the green Crayola box stripes in the background. Used: China Glaze Salsa for the crayon, mixed with China Glaze White on White for the paper wrapper and highlights, and mixed with China Glaze Liquid Leather for the shadows, and then China Glaze Liquid Leather for the signature black Crayola stripes. Used: Kleancolor Neon Purple for the crayon, mixed with China Glaze White on White for the paper wrapper and highlights, and mixed with China Glaze Liquid Leather for the shadows, and then China Glaze Liquid Leather for the signature black Crayola stripes. Used: Zoya Yummy for the crayon, mixed with China Glaze White on White for the paper wrapper and highlights, and mixed with China Glaze Liquid Leather for the shadows, and then China Glaze Liquid Leather for the signature black Crayola stripes. Used: Kleancolor Barbie Pink for the crayon, mixed with China Glaze White on White for the paper wrapper and highlights, and mixed with China Glaze Liquid Leather for the shadows, and then China Glaze Liquid Leather for the signature black Crayola stripes. Used: Nubar Milk Chocolate Creme for the crayon, mixed with China Glaze White on White for the paper wrapper and highlights, and mixed with China Glaze Liquid Leather for the shadows, and then China Glaze Liquid Leather for the signature black Crayola stripes. Used: China Glaze Turned Up Turquoise for the crayon, mixed with China Glaze White on White for the paper wrapper and highlights, and mixed with China Glaze Liquid Leather for the shadows, and then China Glaze Liquid Leather for the signature black Crayola stripes. Used: Ultra Pro in Blue Blaze for the crayon, mixed with China Glaze White on White for the paper wrapper and highlights, and mixed with China Glaze Liquid Leather for the shadows, and then China Glaze Liquid Leather for the signature black Crayola stripes. Used: Zoya Paz for the crayon, mixed with China Glaze White on White for the paper wrapper and highlights, and mixed with China Glaze Liquid Leather for the shadows, and then China Glaze Liquid Leather for the signature black Crayola stripes. Used: China Glaze Peri-wink-le for the crayon, mixed with China Glaze White on White for the paper wrapper and highlights, and mixed with China Glaze Liquid Leather for the shadows, and then China Glaze Liquid Leather for the signature black Crayola stripes. Used: China Glaze Liquid Leather for the crayon and Crayola stripes, mixed with China Glaze White on White for the paper and highlights. Topped everything off with two coats of Seche Vite top coat, because it's the shiz. 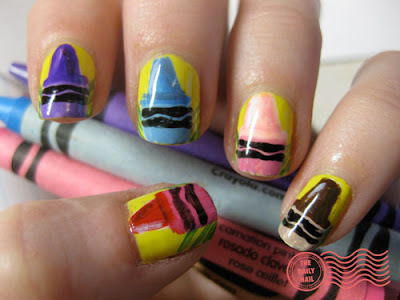 I don't know how you have time to make shirts/paint your nails/ make chocolate concoctions, but you're awesome. i check this website everyday! I love this idea. Also for Christmas (if you celebrate it): Wrapping paper nails! That is so cute! I love crayons! Sooo cute! 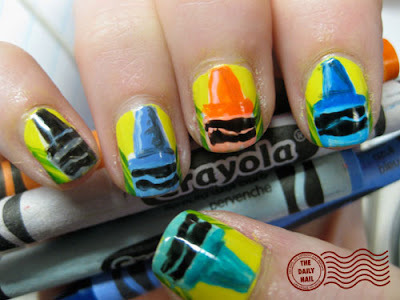 I love the crayon idea! Oooh! That's so awesome! I bet kids would love that design, especially. 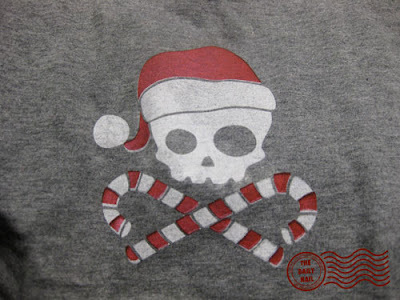 And that skully santa is awesome as well. Really cute! :) Your nails are looking really good too. Where are Burnt Umber and Flesh, my two favorites? This is my favourite so far. I think Mondrian style primary colour grids would be good. Anonymous: I've considered Hello Kitty, Im not a huge fan, but I know a lot of people have requested it :-P Wrapping paper is on the list for christmas!!! Tracee- I still say that most of the time. :-P crans! Ohhh, you would look at the box and just see all of the possibilities! I also used to love the way Crayola crayons smelled. I would open the box and just sit there smelling them. (before tearing in and coloring like mad...) Pencils and Scotch Tape, too. I was an odd child...you'd think I would have gone into the stationary business, no? Another thing I discovered with Crayolas when I was a kid, (and now sometimes as an adult, but in a more controlled way) was that you could melt them on the radiator. Much to the dismay of my mother and our landlord, I thought that a hot radiator+crayon pressed against it=the most amazingly beautiful, drippy mess in the universe. Totally mesmerizing to the young me. I couldn't get enough. Luckily, even though she yelled at first, I had a great Mom, and she saw that I was in love with this process, so she worked out that we could do it and SAVE IT if we covered the radiator and floor with aluminum foil. 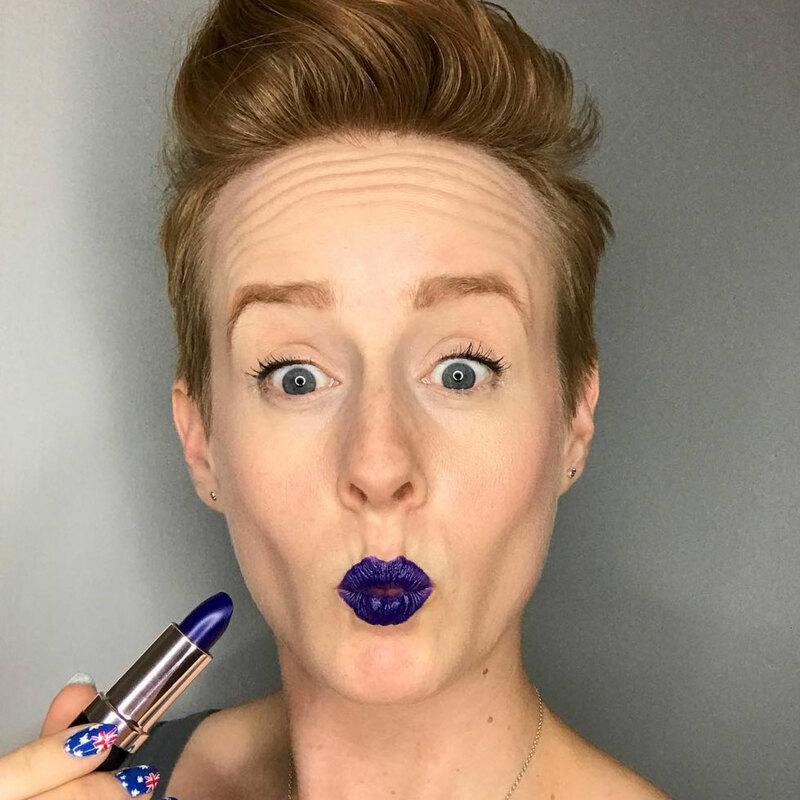 That's where I started my love of interesting color pairings, I think. And then you could then crack off the dried mixed colors and use them as a mixed color crayon! (but it no longer looked like one...) sigh. Good times. Oh these are just too cute! I am having a blast following you and your nails...You are a hoot! I just wanted to leave a comment here to thank you for the t-shirt inspiration. For x-mas I usually make my brothers-in-law t-shirts and couldn't think of a single thing. Then I saw your urban threads t-shirt and it was decided. I LOVE Urban Threads designs and since then I've made 9 shirts (once I started I couldn't stop, so everyone on my x-mas list is getting shirts). I just wanted to thank you again for the great idea!! these are awesome I teach 3 year olds and they would love these! you are quite the artist! This is so cool, mad props on the creativity! I'm deffinitely going to try this!! Excellent execution! We used to lay a paper towel on the ironing board, then a sheet of wax paper, shake out the wax shavings from the crayon box onto the wax paper, cover with another sheet of wax paper and then another paper towel. Press with a warm iron until the shavings melted and the waxed paper sheets fused. The paper towels didn't stick and we had 'stained glass' art. I need to go buy some crayons, and maybe a coloring book. LOL.